Pineapple adds a taste of the tropics to some of our favorite recipes, from savory dinner dishes to sweet desserts. While we love the convenience of using canned pineapple in many of our recipes, it's always nice to use fresh pineapple when it's available. If you've never bought a fresh pineapple because you've been intimidated by the spiky outer flesh then we're here to clear your troubled thoughts! Cutting a pineapple is actually very easy and very worth it! Check out our video and tips below on how to cut a pineapple. 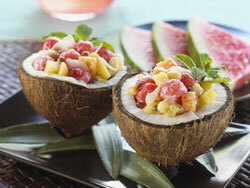 It's so easy, you might find yourself making a "tropical" version of everything! 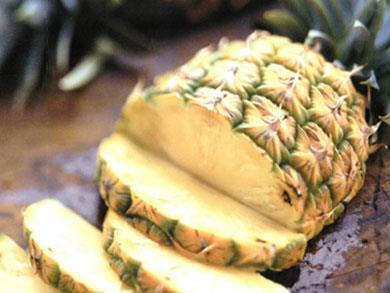 Before you learn how to cut a pineapple, it's important that you always start with a ripe pineapple. Selecting a ripe pineapple is easy! All you have to do is grab the center leaf of the the pineapple and gently pull it. If it comes off easily, you have a ripe pineapple! 1. Remove the leaves. Hold the pineapple securely and twist off the top. 2. Cut off the top and bottom. Lay your pineapple down on its side to cut a slice off the top and bottom. This will make it easier for the pineapple to stand secure and upright while you're cutting off the skin in the next step. 3. Cut off the skin. Use a Chef's knife to cut the skin off the pineapple, making sure not to cut too deep. It's okay to leave a few of the "eyes." We think it lets people know you used a fresh and delicious pineapple! Continue cutting until there is no skin left around the pineapple. 1. Lay the pineapple on its side and cut slices. 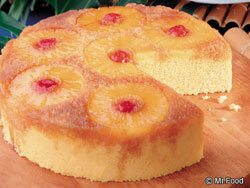 You can make the pineapple slices thin or thick, based on your preference! 2. Take one pineapple slice at a time and remove the core. Use an apple corer or shot glass to cut out the center of the pineapple slice. Just press down until you've cut through. Practice your new pineapple cutting skills with these easy recipes!